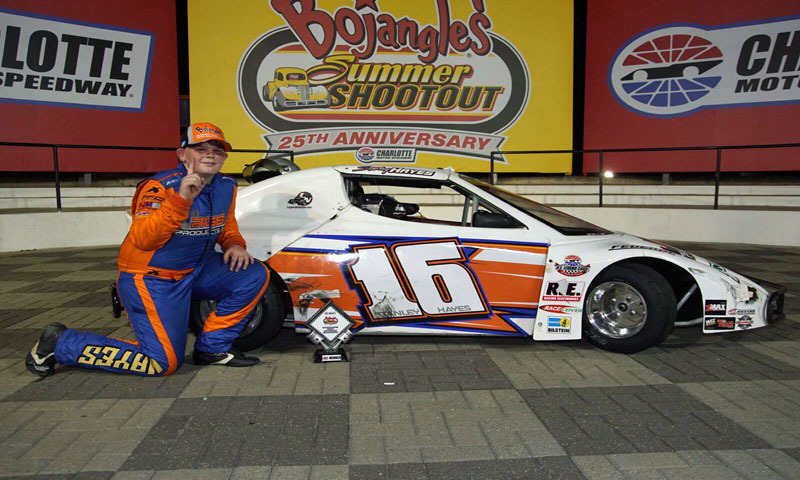 CONCORD, N.C. – Championship battles came into focus during Tuesday night’s eventful, action-packed sixth round of Bojangles’ Summer Shootout grassroots racing at Charlotte Motor Speedway. In addition to the future stars of racing mixing it up on Charlotte’s frontstretch quarter-mile, fans were treated to a quad racing exhibition and an autograph session featuring NASCAR standouts Daniel Hemric, Corey LaJoie, Noah Gragson and Spencer Boyd. The Bojangles’ Summer Shootout served as the nightcap to a day-long ROVAL™ Test Fest, which saw NASCAR’s biggest stars shaking down the 2.28-mile, 17-turn ROVAL™ road course oval. The quarter-mile, four-turn frontstretch oval provided more than its share of excitement on Tuesday, as the K1 Speed Young Lions division highlighted the wheel-to-wheel action that is synonymous with Bojangles’ Summer Shootout racing. “Bo Time” was “Go Time” for Bryson Ruff in the K1 Speed Young Lions feature, as the Bojangles’-sponsored driver executed the “bump-and-run” maneuver to perfection with two laps to go, clearing Holt Halder and speeding to a well-earned win. Halder narrowly missed out on joining brother Hudson in the winner’s circle, finishing just .211 seconds in arrears of Ruff. Steven Chapman, Isaak Love and Ryan Rackley completed the top five. Tyler Letarte – the son of former NASCAR crew chief and current NASCAR on NBC analyst Steve Letarte – finished 13th in his Legend Car debut at Charlotte. Rodney Tharp prevailed in a caution-filled Cabarrus Brewing Company Masters feature for his first win of the season. Tharp won the abbreviated race, which was shortened to 14 laps after a vicious crash involving Robby Faggart and Carl Cormier. Battling with Faggart for third, Cormier’s car broke loose coming out of Turn 2 and clipped the right rear of Faggart’s car, sending it head-first into the backstretch wall before the front end burst into flames. Faggart and Cormier, however, walked out of their damaged cars under their own power. Joey Padgett passed polesitter Nick Sanchez on Lap 15 of the 25-lap Legend Car Pro feature, but Padgett’s bid for victory required a series of perfect laps to keep a hard-charging Hudson Halder and Sam Mayer in the closing laps. Halder’s final try at a race-winning pass fell short entering Turn 3 on the final lap, leaving Padgett out front at the finish line. Padgett’s No. 83 car failed post-race technical inspection, however – leaving the win to Hudson Halder. The 25-lap VP Racing Fuels Semi-Pro feature saw its first 23 laps go caution-free before polesitter Tristen Love – whose lead evaporated due to lapped traffic – received a bump from Drew Dollar, knocking Love back to second. Harrison Halder moved up to third before contact with Love sent Love spinning and Halder to the rear of the field. Dollar kept command of the race after three late restarts to grab the win. Justin Gareis chased down Zac Fowler and collected his fifth Charter Schools USA Bandolero Outlaw win of the season. The driver of the black-and-white No. 53 scored his eighth victory in his last nine starts dating back to the 2017 Bojangles’ Summer Shootout. Fowler held on for second with Santiago Hill, Trevor Wester and Luke Akers completing the top five. Stanley Hayes rolled into victory lane after winning a back-and-forth battle for Bandolero Bandit supremacy over Zack Miracle and Parker Eatmon. Luke Morey edged Sean McElearney in a hotly contested Beginner Bandit feature which served as the opening card for Tuesday night’s events. Morey held McElearney off on a late restart to prevail by .311 seconds. Following the second ROVAL™ Test Fest – a free test among Monster Energy NASCAR Cup Series teams on the ROVAL™ from 9 a.m.-5 p.m. on July 17, the Bojangles’ Summer Shootout gets its own portion of NASCAR stardom. Race fans in attendance can check out a driver autograph session featuring NASCAR standouts Erik Jones, Matt DiBenedetto and Cole Custer from 5:30-6 p.m. on the speedway’s concourse. Race fans who attend Test Fest will receive a voucher for a free ticket to the Bojangles’ Summer Shootout. Legend Car Pro (25 laps): 1. Hudson Halder; 2. Sam Mayer; 3. Daniel Wilk; 4. Derek Lemke; 5. Dillon Spain; 6. Gus Dean; 7. Dawson Cram; 8. Nick Sanchez; 9. Garret Manes; 10. Joey Padgett. Beginner Bandits (20 laps): 1. Luke Morey; 2. Sean McElearney; 3. Michael Boyles; 4. Tristan McKee; 5. Josh Horniman; 6. London McKenzie; 7. Skyler Chaney; 8. Hunter Jordan; 9. Max Reaves; 10. Ayrton Brockhouse; 11. Jonathan Speas.